Chinese football has been making headlines but despite the arrival of the big name stars, the country still has to build a football culture and get people actually playing the game. Efforts are underway but it is going to take time. China is full of huge cities that are virtually unknown in the west. The central city of Chengdu, for example, has a population that is close to 15 million. Wander around the crowded streets and you will see, nestled among the hundreds of Sichuan-style hot pot restaurants, kids playing table tennis in school yards and basketball outside their apartments. Yet coming across an impromptu kickabout is as likely as seeing a tourist leave the nearby panda research centre without a cuddly souvenir. That is a major reason why the past assumption outside China -- that a nation of 1.3 billion had to produce 11 world-class players sooner or later -- never held true. The Chinese don't play football. Especially kids. There was a famous statistic back in 2011 that had Japan with 300,000 registered Under-12 players. China, in contrast, with a population ten times bigger, had less than 10,000. There are various reasons why participation rates never really took off. The country’s one-child policy acted as a brake on football development.Traditionally, parents regarded their child as their old age insurance policy. The unspoken arrangement was that the parents do everything possible for their offspring to succeed in return for being well-looked after in their dotage. Study and books, not soccer and boots, were regarded as the sensible way forward in this regard and this was all the stronger for those families with one son. Until recently, Chinese football was poorly-paid, full of corruption and offered all in all, a highly uncertain career when compared with medicine, law or business. Those who did have an aptitude for sports and wanted an athletic careers were generally pushed towards individual events such as gymnastics or table tennis that offered a more predictable route to success. Whether the lack of football success has led to a lack of participation or vice-versa, is not important. What is clear is that, in order to succeed, China needs to build a football culture.This is the country’s biggest challenge. Tom Byer, an expert in youth development, was brought to Beijing to advise the government about the game. In this part of Asia, that will not be easy with the country bordering, among others, India, Pakistan, Mongolia,, North Korea and Afghanistan. This is not exactly a region at the centre of global football power —yet. The Chinese Football Association (CFA) is aiming to change all that. Last year, the organisation unveiled a strategy that would see China become a world football superpower by 2050 with a number of short and medium targets in between. Less reported but just as important was the target of having 50 million people playing the game by 2020. That is not going to happen but it is an indication that the authorities know that this first target is necessary for the eventual goal to be realised. Byer has been brought in by the Ministry of Education that has been rolling out a football program to thousands of schools across the country. It is not just about giving millions of kids a regular taste of football but coaching the coaches too. This is what the government wants. Especially Xi Jinping. 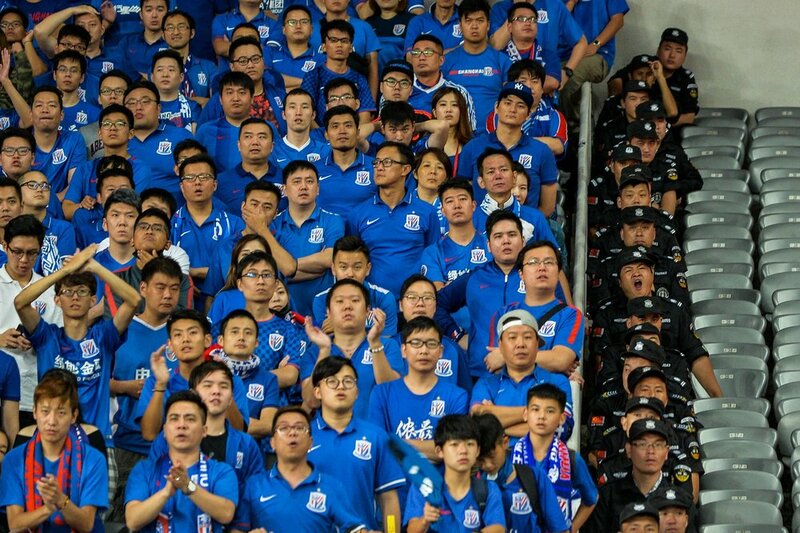 Beijing is serious about making China a football force to be reckoned with. Much of the money has come from big conglomerates that started to invest in Chinese football. Maintaining good ties with the Beijing government and local and regional party officials makes for good business sense for these companies. Back home, the first conglomerate to really get involved was Evergrande. In 2010, the company took over Guangzhou, a club relegated to the second-tier as punishment for match-fixing, in 2010. Evergrande started a spending spree. Much of the Chinese national team were recruited. After promotion, Dario Conca joined in July 2011. The Argentine playmaker may not have been a household name but suddenly became the third-highest paid player in the world. Guangzhou took their first title in the same year and have won all five since. They are now coached by Luiz Felipe Scolari and have Paulinho, Ricardo Goulart and Jackson Martinez in their squad. Others have spent six years and lots of money trying to catch up. Shanghai SIPG shelled out over $100 million on Oscar, Hulk and Andre Villas-Boas as coach. Fabio Capello is coaching Alex Teixeira and Ramires at Jiangsu Suning, Felix Magath has Graziano Pelle at Shandong while at Hebei, fans can watch Ezequiel Lavezzi on the pitch and Manuel Pellegrini on the bench. On the surface and in the short-term, it has been a success. Attendances have risen to almost 25,000, making the Chinese Super League one of the most-watched in the world and the number one in Asia. Over 50 countries bought rights to broadcast league games and with the national team now coached by Marcello Lippi, there is hope that one of football’s great underachievers can start appearing at World Cups on a consistent basis. It all adds up to the overriding aim of turning China into a football nation. The top tier spending may have gotten out of hand but was done partly as a response to the central desire to give kids stars to get excited about and hopefully, be inspired by. While grassroots development is critical to give kids the chance to play, the increasing glamour of the top tier should also help them want to play. While the foreign imports make all the headlines, it is often forgotten that clubs are only allowed to sign five foreign players. Only three of those can be named in a matchday squad. Clubs now realise that in order to win the title, it is not just about buying the best foreign players, it is about having the best locals. This is pushing fees and salaries for Chinese players up and it is starting to trickle down to the second tier too. With the more lucrative television deals now, there is more incentive. The government also worked hard to eradicate corruption in the game and while the job may not be finished, the perception is that the league is much cleaner than before. The recent trend of Chinese companies buying European clubs does not only help them import knowledge and expertise, it will also give future generations of Chinese players and coaches --at youth and senior levels-- an easy route into Europe. It seems to be but it is going to take a long time. Despite some negative headlines internationally about the standard in China, nobody in the country believes that the Chinese Super League or the national team is anywhere near the standard set in Europe. Yet to be a global force by 2050 is not out of the question. Hosting the World Cup --China could stage a 48-nation tournament now-- in the next 15 years will be a major milestone and a big boost. It all adds up to getting more kids to play the game in cities like Chengdu. Only after that will there be a chance of seeing the World Cup trophy on the streets of Beijing. The Chinese Super League has made headlines with insane offers for some of the world’s top players. But what happens when the players finally arrive at their new clubs? Get a behind the scenes look at the growing football culture in China and see how the players are handling this new challenge.